make a cherry scented palette? - and the gentle sweetness and unctuousness of vanilla is poetry juxtaposed with the tart fruit. 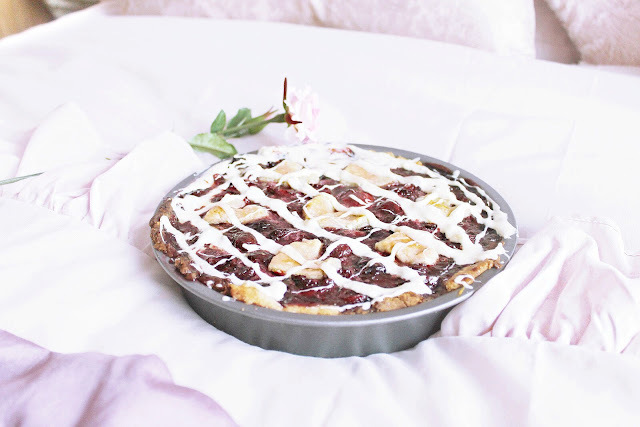 I wrote a piece of prose not long ago about Clafoutis, a cake containing cherries and brandy, but here is the real deal! (Minus brandy) I hope you enjoy both poem and recipe. A forenote: as a finishing touch, and purely for decorative purposes, I lavished the finished pie with white chocolate to finish, but let it cool a little too long beforehand! It became a little chunkier and trickier to work with, especially as I was in a rush and the pie was still a little warm from the oven. Starting with the dough, cut the butter in to pieces and blend together with the flour, salt and shortening until the mixture resembles breadcrumbs. Add 5 tablespoons ice water and pulse just until mixture forms a dough, adding a tiny amount more ice water if dough is still too dry. Divine dough in half/two sections - I set just a small amount aside to make the pastry hearts - and flatten both sections in to a disk shape. Next, wrap both in plastic wrap and chill for at least 30 minutes. Now, on to the filling! In a small bowl stir together sugar, tapioca, salt and cinnamon. 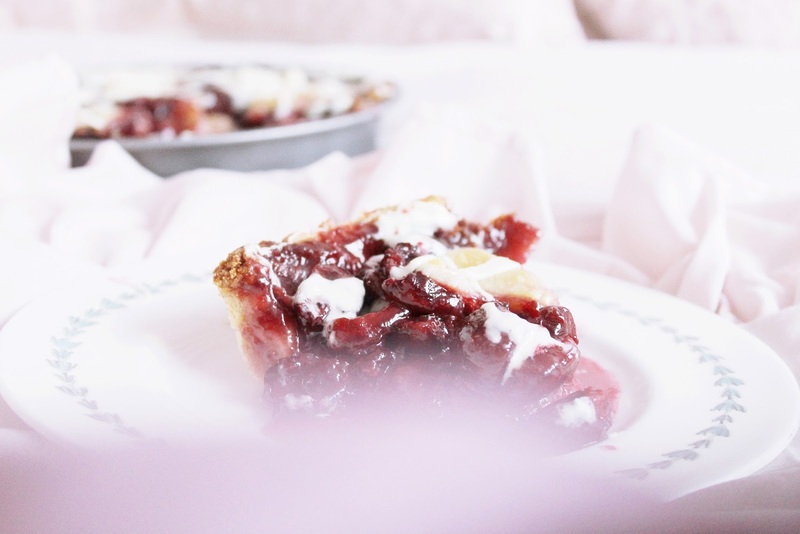 In a large, heavy skillet, cook fresh or frozen cherries over moderately high heat, stirring, until slightly softened, about 2 minutes. Next, transfer the cherries to a heatproof bowl, leaving the cherry juices behind. Add the sugar mixture to the cherry juices and simmer, stirring until thickened, for about 3 minutes. Add the cherry sauce to the cherries, stir in vanilla essence and cool. Line lower rack of oven with foil and preheat oven to 400'F. On a lightly floured surface with rolling pin, roll out 1 piece of dough to about 1cm thick and fit snugly in to your tin, leaving a little overhanging the edges. Pour the filling in to the shell and chill, loosely covered with plastic wrap. On a lightly floured surface, roll out remaining dough and style as desired! I used a knife to sculp some little hearts, about 1/2 centimetre thick, but you could also cut some pastry strips to weave in a lattice pattern on top. Gently brush finished pastry with cold water and sprinkle with sugar. You could also use egg whites to brush pastry if you have some spare, like with my mini apple pie recipe. It smells so delicious when cooking! If you have any spare mixture you can use it to make some lil jam tarts, one of Oscar's favourites! Bake in middle of oven for 45 mins, until pastry is golden and the filling just begins to bubble. Leave on a rack to cool and drizzle with melted chocolate or serve with ice cream. A little extract... That night, all alone, anyone might have crumbled before that cherry, snapped down the plate and split apart lips of fragrant jelly. Fingers lurched and haemorrhaged fruit, unearthing listening, glistening fronds of fruit and strings of flesh. A schoolboy's drawn out breath measures cold landscapes of batter crusts, crossing black coulis like long, wild sands, splitting apart, oozing black tide ponds. Bang! In the gilded glimmer of spoon, something cold and black caught between lipped rim and drop; his clatter of metal on the tiles. Shock locks the body; hot fear "..." the fridge is left ajar, like a poised breath. You did a really good job at this! 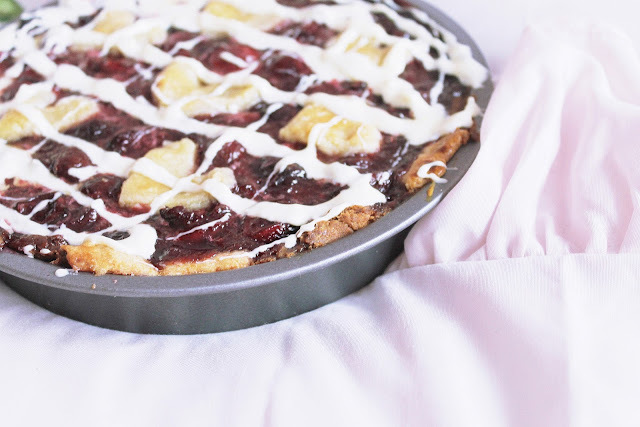 I'm not a fan of cherries but I'm finding myself drooling over these pictures... if only I knew how to bake! I'm awful at that kind of stuff. 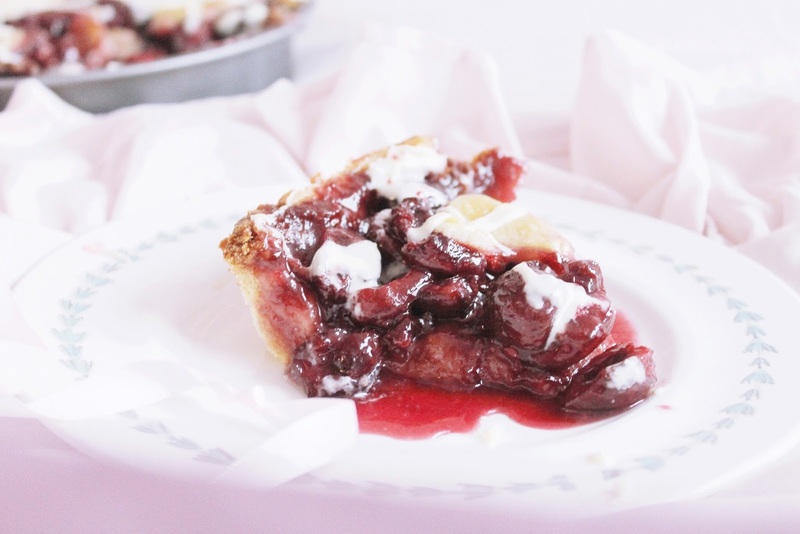 I never really liked cherries that much but by the looks of this pie I have definitely changed my mind. This looks super yummy ! 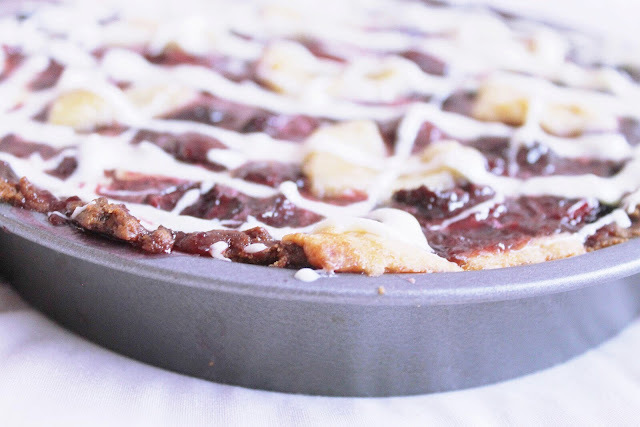 This looks absolutely delicious, I love the pictures/your photography too! 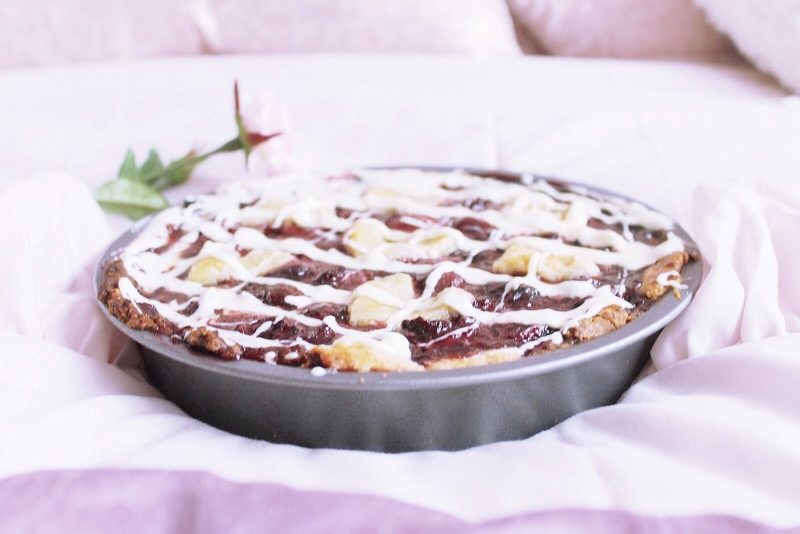 Very romantic & Valentine's inspired :-) This post has reminded me how long it's been since I've had a good little baking session and how much I enjoy it, I think it might be time to crack out the rolling pin! Lovely post! This looks (your photos are gorgeous!) and sounds delicious! 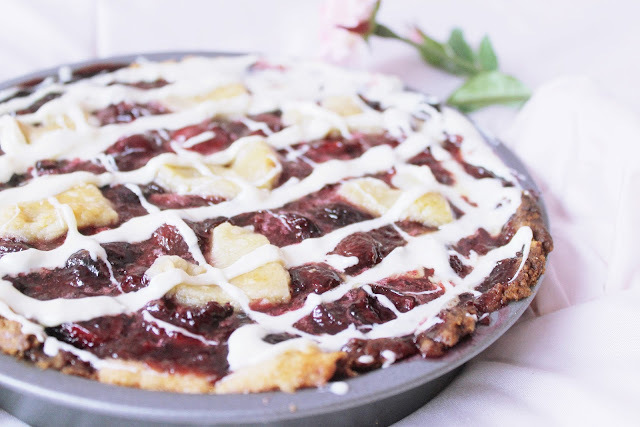 I would love to make this but I'm the only one in this house that likes cherries and I don't think I could stop myself eating the whole thing! I've got this bookmarked though and may try and reduce the ingredients to make a mini one for myself because I don't think I could pass this up, especially with the white chocolate extra! This looks absolutely amazing, this with some cream poured over it... Mmm! 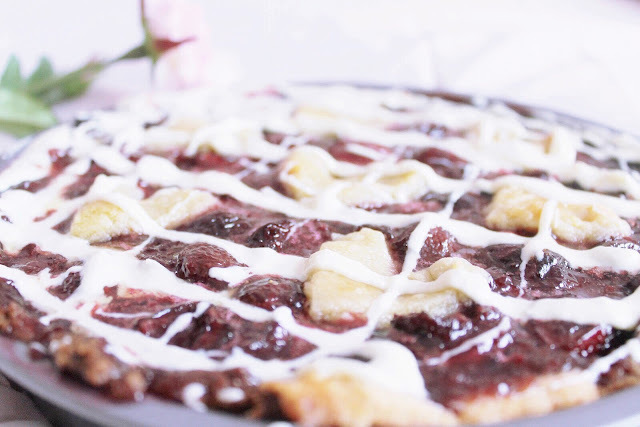 Wow, this pie looks so yummy! I also love everything that's cherry flavoured or scented. 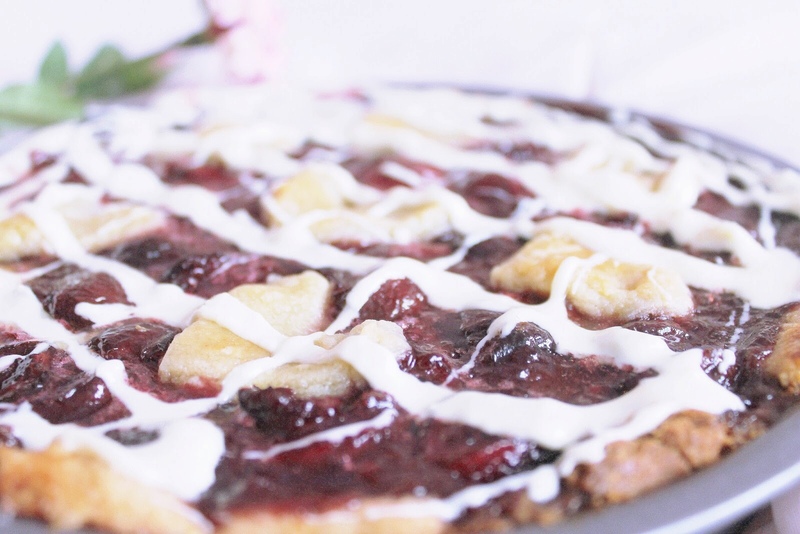 Clafoutis is a really good dessert, and this is indeed quite similar - and seems just as good! :D The idea of white chocolate on top is great, even though it made it more difficult to work with. It must have tasted amazing! Oh gosh that looks so yummy!